The international community must act to get rid of the “Iranian invasion,” in Syria, acting head of the main opposition group, the Syrian National Council (SNC), said during a press conference held in the Turkish capital on Saturday. Sabra sounded the alarm that what is happening in Syria is also an attempt by the allies: “Iran, Hezbollah and Iraqi Prime Minister Nuri al-Maliki” to transform the region into opposing groups and to dismantle peaceful coexistence that has long been enjoyed by the region’s different religious sects. However, he said what is happening in Syria “will close doors” for diplomatic initiatives needed to end the conflict. “You invaders, Syrians will wait for you in every street in the country,” he threatened, indicating a stronger stance being taken by the SNC. He urged the Arab League to enact a provision that stipulates other Arab countries defend another Arab state under invasion. The Syrian opposition gained the empty Syrian seat at the Arab League in March 2013. “The invaders have placed their black flags on our mosques and churches in Syria,” Sabra said in reference to Hezbollah supporters raising flags with the Shiite “Ya Hussein” or “Oh hail Hussein” inscribed on it. Sabra, a Syrian Christian, rebuffed claims that the rebels fighting against Assad’s regime are “terrorists” or radical Islamists. “The sheer fact that 100 different protests took place yesterday in Syria,” indicates Syrians are demonstrating peacefully, he added. 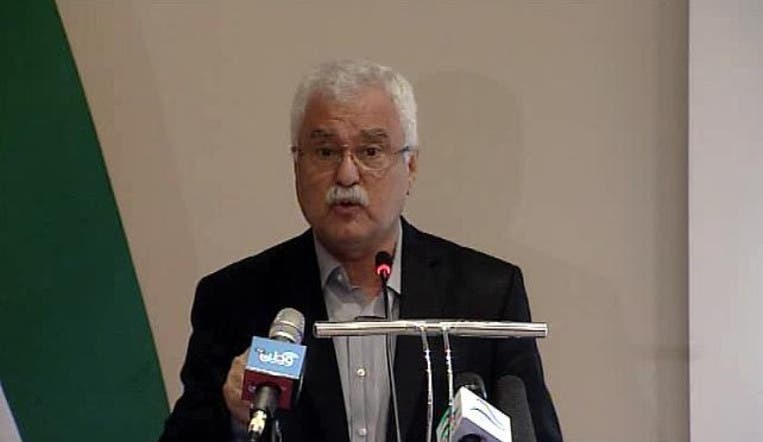 Meanwhile, Secretary General of the SNC, Mustafa al-Sabbagh, said it is “evident” the Syrian regime has fallen. “The biggest indicator that the Syrian regime has fallen is that we Syrians are fighting Hezbollah and Iran on our land,” adding, “we urge the international community to show its commitment,” and end the two-year conflict. 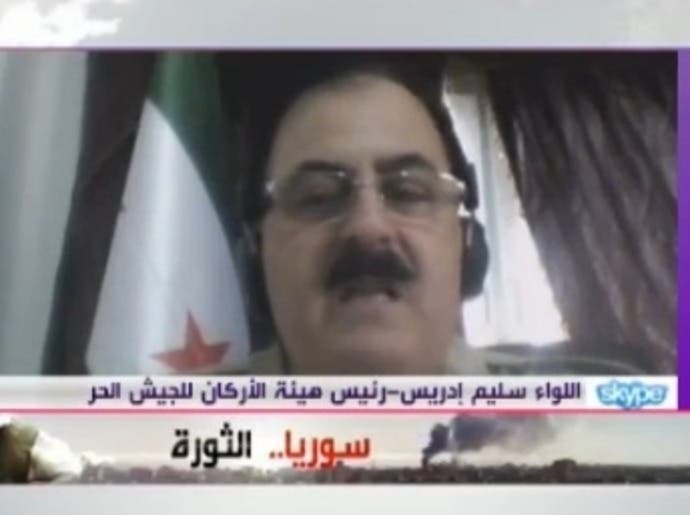 Meanwhile, the Syrian regime that is backed by Hezbollah is currently recruiting more “sectarian” militia fighters from Iraq and Iran, the Free Syrian Army chief of staff told Al Arabiya Saturday. Salim Idriss, leader of the Free Syrian Army. Iranian presence in Syria initially started with the supplying of “experts” to the Syrian government for both “technical and intelligence backing,” however, their role has now grown as more Iranian forces arrive in Syria, he said. The chief also unveiled some information on Hezbollah’s training process. The FSA leader urged the “Friends of Syria” group to send helicopters, anti-tanks arms instead of “food supplies and medicine” to the rebels. Meanwhile, he described European fighters backing rebels as an “individual case” of people who infiltrated Syrian borders. Idriss, who also participated in the Istanbul conference on Saturday, said the FSA will fight Hezbollah, but, FSA will not transfer the conflict into Lebanon. French Interior Minister Manuel Valls told Al Arabiya on Friday that more than 600 European nationals, including 120 from France, were fighting in Syria. “The phenomenon of European fighters in Syria forms a serious and big terrorist and security challenge,” Valls said. He said many jihadists were fighting alongside groups affiliated with al-Qaeda, warning their return could jeopardize the security of their home countries. On Saturday, the village of Buwayda, the final opposition stronghold in the area surrounding Syria’s central town of Qusayr, has been reportedly captured by Syrian government forces backed by Hezbollah. “Our heroic troops have restored safety and security in Eastern Buwayda,” AFP news agency reported Syrian state television as saying on Saturday. Hundreds of people who fled Qusayr during battles between opposition and regime fighters had taken refuge in Buwayda when the town was captured by Syrian forces earlier this week, according to AFP. Syrian state television broadcast footage of a barren village devoid of signs of life. Hezbollah also announced the news of Eastern Buwayda’s fall on its own television channel, Al-Manar. Syrian opposition fighters withdrew overnight Wednesday from Qusayr near the border with Lebanon after an onslaught by the Syrian army and Hezbollah fighters killed hundreds of people, a rebel statement said. Meanwhile, dozens of rebel fighters wounded in Qusayr battles were treated in Lebanon, a security official told AFP on Saturday. “Some 30 wounded fighters are being treated in hospitals in the Baalbek area” of eastern Lebanon, the security official told AFP on condition of anonymity. He also said “dozens of wounded rebels” had arrived in Arsal in northern Lebanon, awaiting treatment. Lebanon is becoming increasingly drawn into the two-year Syrian conflict that killed at least 80,000, according to the UN. More than 500,000 Syrians fled the conflict and sought refuge in Lebanon.